Action from Panthers v Scunthorpe last season. Promoter Ged Rathbone admits that the first few weeks of the new SGB Championship season will reveal a lot about Peterborough Panthers’ chances of success. The city club’s full 2017 fixture list has been released this morning (January 24). They face Scunthorpe in their first competitive meeting of the season. The two sides clash at the East of England Showground on Friday, March 24 with a return date in Lincolnshire nine days later. Panthers also face highly-rated Ipswich and Sheffield in the early part of the campaign while also having to negotiate a KO Cup tie against a revamped Redcar side. Rathbone said: “The riders can’t wait for the season to start - and I’m sure everyone else feels the same. “We’re all looking forward to what is likely to be the most unpredictable and exciting year for some time. “I’m expecting all 10 teams at our level to be very closely matched and that means any of them can beat any other - home or away - on any given day. “The opening few weeks will give us a good idea of where we’re at. Our aim will be to qualify for the play-offs and I’m sure the nine other clubs will have the same goal. Panthers will hold their Press & Practice event on Friday, March 17 and are working to secure Challenge fixtures – both home and away, and against Premiership clubs – for the following two days. The club stage the British Under 21 semi-final on April 11 and will also lay on two other national meetings that month. The opening round of the British Youth Championships is to be split across two dates at Alwalton. 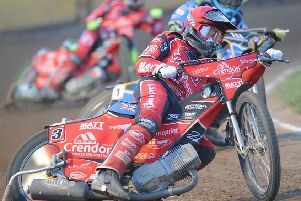 The 500cc and 250cc classes will take to the track on April 9 after a Panthers’ cup tie against Redcar, and the 150cc and 125cc classes follow an East Anglian derby against Ipswich. The club will also stage the Championship Fours with the date of that event still to be confirmed. * Panthers will stage the first round of the British Youth Championships. The 500cc and 250cc classes take place on April 9 and the 150cc and 125cc brackets on April 16. They will follow club meetings on both of those dates. * Panthers will again stage the Championship Fours, but the date is yet to be confirmed.